Farewell Chowder, you will be missed. They say that all good things must eventually come to an end, and unfortunately on August 7th 2010 Cartoon Network aired the final episode of Chowder, a phenomenal comedy series that the network gave up on long before it's final broadcast. It's a shame, the show was primed to be the next big thing on CN and many people felt as if this show was going to break down the barrier of the network's inability to create something that would compete with SpongeBob Squarepants as their franchise show that was going to rake in millions of viewers on a weekly basis and sell tons of DVD's and merchandise, unfortunately for Cartoon Network the show began to decline in ratings about a year or so after it's debut and instead of getting behind the show to try to fix the problem, CN decided it would be better if they forgot it existed. The show would begin to receive minimal promotion leading into the summer of 2009 and eventually reruns of new episodes would become scarce, much of this could have been due to the network trying to promote their new live action projects over their animated shows in an attempt to get them off the ground but Chowder would more than feel the backlash of the new live action movement on Cartoon Network. Eventually the show was officially cancelled and the remaining shows would be spread throughout the next year in premiers while the cast and crew would all move on to other projects, unless you were a member of the animation community on the web then you wouldn't have even known the cancellation happened because there was still 20+ episodes of the show left to air when the program was shown the door. But instead of dwelling on the death of the show, I think it's time that we recognize the life of the show and just how good Chowder actually was. Above everything else Chowder as a television show is hilarious, everything from the names of the food that they would cook, the way that the main characters interacted with each other (especially Chowder and Shnitnzel), the inappropriate fart jokes and the over the top 4th wall bashing the show was just crammed with humor and it worked so well with the kind of story that the creators wanted to tell. 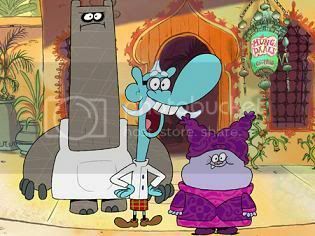 Personally, I loved how Chowder himself couldn't get anything right, he would constantly screw things up by forgetting things or eating something he shouldn't have and Mung or Shnitzel would usually suffer the brunt of the consequences, it was genius how the shows creators brought it all together the way that they did and I can see why so many people loved this series so much. That's right, people did watch the program, the ratings for the show were pretty strong throughout most of it's run which led people to wonder why the network would give up on the show so soon without having a proper reason to do so, it's not like the ratings were in the toilet, most weeks the show would pull in between a 1.7 and a 2.0 which is considered to be pretty good for it's time slot. The ratings for Chowder were pretty much on par with most of the other comedy shows that CN aired at the time (Flapjack, Johnny Test) and CN's weekly comedy block "HAr HAr ThArsday's" was the shows home for a solid chunk of it's run and usually it would air in the first slot within the block which was 8pm EST. 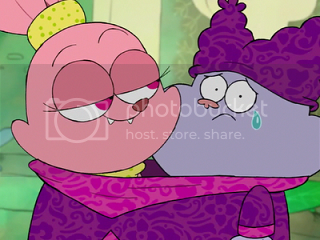 Ratings aside, much of the internet animation community enjoyed this series and praised it week in and week out on various forums throughout the web as well as Facebook and Twitter, tons of people all over the world were embracing Chowder and it wasn't just children, it was adults too. It's void will definitely be felt by those who frequent Cartoon Network on a weekly basis, especially on Monday nights, it's become such a big part of CN's weekly programming schedule that to envision the network without the show seems somewhat unfathomable, but thankfully as of this writing the show is still being aired almost daily in reruns. At least Chowder still lives on in some form, but you can't help but to wonder for how long. As I mentioned earlier, the creators of the show have all moved on to do other projects now, but I would like to take this time to thank them for supplying myself (and many others) with a series that has given us some fantastic memories and a whole lot of laughs, and come to think about it, laughter is a rare thing these days when it comes to shows that are supposed to be"comedies" and I feel that Chowder succeeded in genuinly making people laugh. So once again, thank you to G.H Greenblatt and company for bringing to life such a fantastic group of characters and for making animation fans laugh, if only for a short period of time. As always I want to thank those who took the time to read my blog, it's much appreciated and you can always check me out at www.twitter.com/manga4life as well as TZ and FUNI. Hello readers, it's M4L back at it again with a review of an anime series loved and respected by almost everyone who has taken the time to watch it, today I am going to review the infamous "Trigun". Trigun is often credited alongside Cowboy Bebop as being one of the few anime series that helped the medium find a mature audience in Japan as well as the United States, anime fans were hitting retail outlets pretty hard to get their hands on DVD releases of the series which eventually led Trigun to be aired on Cartoon Network's Adult Swim in 2003. A big reason as to why fans were seeking out Trigun so forcefully was because of it's mature plot and style of storytelling which was a lot different from the Saturday morning "toyetic" anime shows that were being aired at the time, people knew Trigun was different and mature anime fans wanted to experience a show that they could dive into for a change. The plot itself is centered around a slick gunman by the name of Vash the Stampede, who inadvertently causes damage almost everywhere he goes thanks to being hunted because of a huge bounty on his head, and two insurance agency employees (Meryl & Millie) who follow him around in an attempt to minimize the damage he causes. 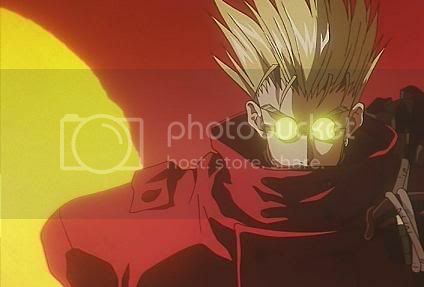 Throughout Vash's travels he tries his hardest to save lives through non-lethal force, but people usually end up dying or getting seriously hurt in the process, eventually Vash meets up with a smooth talking Priest named Nicholas Wolfwood who joins up with him on his travels for a majority of the series. One running gag throughout the series is that most of the damage caused by Vash isn't really by his own hands, often times throughout the series he will be confronted by bounty hunters who want to kill Vash in order to receive the "Sixty-Billion double dollars" prize on his head, then soon after the fight is finished and the town is damaged, Meryl and Millie will usually give him an ear full about how their insurance company cannot keep paying for damages that he has caused and that Vash needs to be more careful. A lot of people, myself included, found hilarity in the way the insurance girls would nag Vash throughout the series, it definitely helped to add a fun element that threaded itself throughout a mostly serious plot. Overall I felt the story of Trigun was pretty strong, there were some times both early in the series and later on toward the end that I felt the story dragged a little bit, most of the good stuff was somewhere between episodes 10-18, but overall the series had a decent flow to it and a solid plot. The characters in the series were interesting and fun to follow, especially the supporting cast of Meryl, Millie and Wolfwood, by the end of the series I felt that Wolfwood had become my favorite character in the series. I think a big part of why the Priest became my favorite character was the mysterious feel that surrounded him and the way he viewed the act of murder versus Vash's take on the subject, it dragged me in and made him shine in my eyes. As a whole I felt that Meryl and Millie were just around for comic relief, they don't really do a whole lot besides complain and get in Vash's way, but they added a 3rd dimension to the series that was much needed because I didn't feel Vash's character was strong enough to lead the series all by himself without a little help from an interesting supporting cast, both the girls and Nicholas Wolfwood helped to fit that bill nicely. Vash himself suffers from a strange case of trying to come across as badass and hilarious at the same time, he has a cool character but sometimes the shift in his personality was just a bit much to take and I felt it took away from what was going on in the situations he would find himself in, but in hindsight I feel that the characters in this series were written pretty well and were definitely fun to keep up with, I know others will share a different opinion on them (especially Vash) but I just wanted to note what I felt as I progressed through the show. All posts on this site are © 2010 by Manga4life.. Awesome Inc. theme. Powered by Blogger.